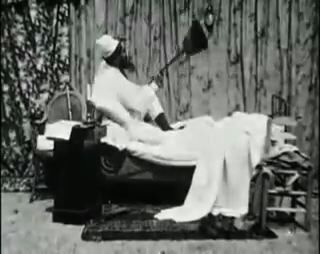 Magically mutinous clothes also were the villains in his 1900 Going to Bed Under Difficulties (Le Déshabillage impossible), where they continuously spawn. All these gags are also used in his 1903 The Inn Where No Man Rests (L'Auberge du Bon Repos). Buster Keaton's 1924 Sherlock Jr.: After the main character steps into the screen, he experiences the "magic of movies" firsthand, as the background scenery revolts against him. Olsen and Johnson's 1941 Hellzapoppin': As the director appeals to Olsen and Johnson to make a film that conforms to Hollywood norms, they walk through different sets. Olsen and Johnson seem oblivious to the fact that their clothing magically changes to match the set - but the director's clothing does not. In that way, Olsen and Johnson's clothes join the film's rebellion against Hollywood norms. Tex Avery's 1952 animation Magical Maestro: A case of continuously transforming magically (literally) mutinous clothes. Then the persona also starts transforming in ways that match the clothes. Chuck Jones' 1953 animation Duck Amuck: Follows the lead of Hellzapoppin' in revisiting the Sherlock Jr. gag of mutinous background scenery that forces Daffy Duck to repeatedly change clothes in order to match the scenery. Then sound, framing, nearby objects, and even the victim's physical form join the rebellion. But this time the source of the mutiny is not magical, but a mischievous mystery animator. 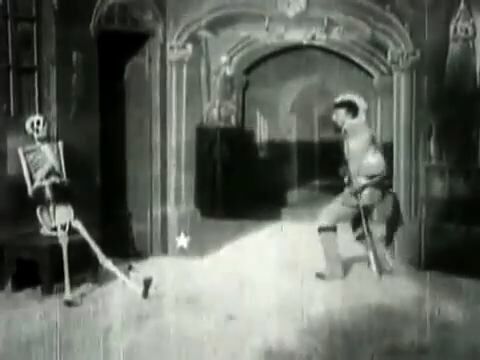 While Méliès' work is usually associated with fantasy and cinema illusions, this film illustrates that some of his best work resulted when he put his imagination and technique in service of comedy, creating cinematic gags that have become staples in screen comedy. This also shows that, as an actor, he had the comic moves needed to showcase his wild comic imagination. The Devil plays tricks, some (bats, shifting furniture) later used in the 1902 'The Farmer's Troubles in a Hotel'.